Police in Israel’s capital prepare for possible riots. Changes may be made to school schedules, light rail train. Police in Jerusalem are preparing for the possibility of disturbances as the Palestinian Authority goes to the UN this week to ask for recognition as a state. A number of potential responses have been weighed, including changes to the school schedule and the light rail train route. IDF Radio reported Sunday that schools in the eastern part of the city may close temporarily, if terrorists threaten principals. 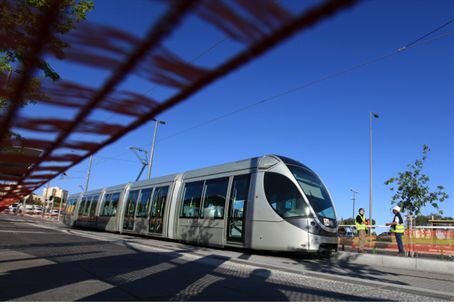 In addition, the light rail train may alter its route to avoid the neighborhood of Shuafat. The majority-Arab neighborhood has been the site of several attacks targeting Jews, and there is concern that rioters may attempt to disrupt the train. The train is designed to be resistant to rock attacks and firebombings. The city is also prepared for the possibility that many of its thousands of Arab employees may not show up for work on the day of the statehood bid – or may even join riots. Former Jerusalem police commander Mickey Levy downplayed fears of riots originating in the capital itself. There may be some disturbances in villages outside Jerusalem, but that is no cause for concern, he told IDF radio. The concern is the possibility of marches beginning in Judea and Samaria, or in villages near the capital, that head toward Jerusalem, he said. “There is no doubt that there will be disturbances, but they will not begin in Jerusalem… The momentum will come from outside,” he predicted.